The Tiger's get a mid-week speed bump against defending A-Sun Champ Lipscomb. Lipscomb this year was picked to finish either second or third in the Atlantic Sun. It's a little hard to gauge just how good the A-Sun is this year because it's best teams can't compete in the post-season. Yes, you read that right. The A-Sun has four teams that have been classified by the NCAA as "transitional" schools: North Florida, Kennesaw State, Florida Gulf Coast State, and USC-Upstate. Each of these schools is ineligible to conference tournament play. So last year, even though FGC had the best overall record (25-8) they were sitting at home while Lipscomb topped Gardner-Webb (now in the Big South conference) 10-9 to earn a trip to the NCAA Tournament. The same thing could happen this year as Kennesaw State is picked as conference favorite, but won't be able to do anything about it in the post season. The Bisons (yes, I know, the plural of Bison should be Bison; it's like saying the "mices" or the "mooses") are led by Coach Jeff Forehand, in his third season. He is pretty active in the community and at the school. Hosting "Forehand and Friends" lunches and activities. Including inviting the "Jelly-Roll" to come speak after his history making appearance in the World Series. He's had moderate success at the small Church of Christ school in Nashville, with 2008 arguably being the school's best go-round. The Bisons (ugh, again) come in to Auburn limping. Dropping three of three to #12 Georgia Tech in Atlanta. Things haven't looked good early, as the team's best player, P Bradon McClurg, had a rough Saturday and GT won the whole series in walk-off style Sunday. 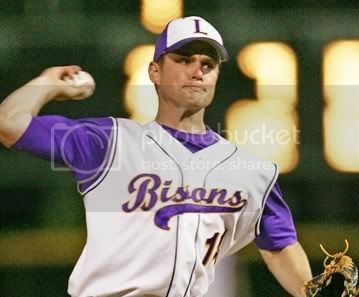 ... McClurg is seasoned and ready for a strong senior campaign for the Bisons. The veteran made 11 starts last season and tossed a pair of complete games. He also had a 3.34 ERA in 91 2/3 innings, while striking out 77 and walking 39. Opponents hit McClurg at a .237 clip last season. With Lipscomb hoping to once again earn the A-Sun's automatic berth to an NCAA regional this season, McClurg will be a key cog. He shouldn't be seeing any action against Auburn tonight. Especially after his Saturday performance (3.0 IP/ 4 H/ 7 Runs/ 2 ER/ 5 Walks/ 1 K). Granted, his team's error filled third sent him to the showers early, but still. 5 walks? Not good. The Tigers and Bisons square off today at 3pm. Freshman Dexter Price will pitch and make his debut for Auburn.